Now before this all begins just know i support guns, so i don’t want to hear about how great guns are. But do know I’m pissed about redneck joe down the street shootin guns off in backyards. 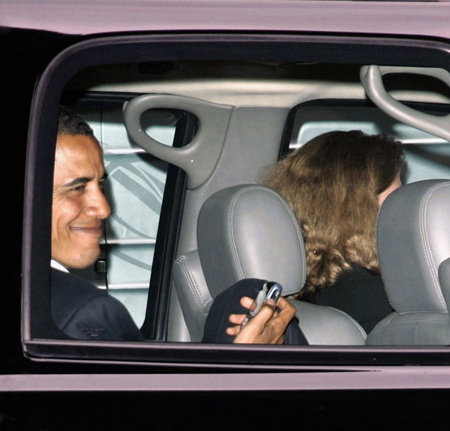 Now that’s out of the way, let me begin….. 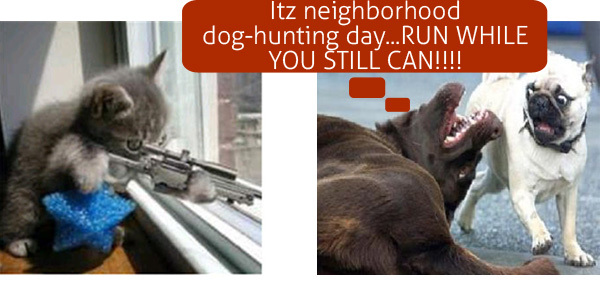 The following takes place between 9:30 – 11 Pm Wednesday, May 12…..
Wednesday's are dog hunting days! 9:30 PM – I’m watching TV, begin to dose off. But trying to stay awake b/c Nicole was on her way home. 10 PM – Four shots fired in my back yard…. 10:00:005 PM – Burst into living room. Head pounding, i can hear my heart beat in my ears. Vision blurry from my drool-sleep. 10:00:11 PM – Race into son’s room. He’s sleeping, nothing is waking him up. 10:00:15 PM – Hear voices outside, go into backyard to see my wife and neighbor talking. No one is screaming, no blood, no sirens. Panic ends. 10:15 PM – Trying to calm things down, i talk to the pack of hunters, informed that stray dogs are killing all of the their cats (which if they just kept tabs on their cats and didn’t let them wander the neighborhood I’d still be sleeping in a good puddle of drool) Hunters inform me animal control told them to “take care of the animals themselves”. We inform them we’re not too thrilled with them shooting on our property, easement or no easement. 10:20 PM – My neighbor calls cops b/c hunters wont leave his property and for shooting on his property. They claim they’re in the UE. 10:40 PM – Still talking to cops. Getting cold and tired. Kinda pissed about the whole easement thing and the fact that people can go shooting guns in our neighborhood according to these 2 cops. Start thinking about how awesome of a sleep I was just awoken from. 10:45 PM – Cops go talk to hunters, neighbor goes in home to write letter to state officials, news stations, brothers, in-laws, home owners association. 2.) Who’s to say these dogs in question (that are getting shot at on this night) are actually stray and the same dogs killing cats. I mean, what if this is actually just someone’s dog that got out for the night!? 3.) If the cats weren’t running amuck, and peeing all over everyones porches, then they wouldn’t be getting eatin up. Heck, I guess I can start shooting at all the ?! @##$%@#$%# cats all over my property. 4.) I have a two year old, and even if you shoot away from my house that bullet could ricochet. It’s freakin’ pitch black at the back of the property, shooting into darkness is STUPID!! Though our lots are .5-.75 acres, we’re still in too close of quarters to be shootin at things going bump in the dark. 5.) The cops could have cared less that people are running around shooting at things. I know it’s legal in the county but c’mon. I’d love to hear what everyone thinks about this. Can people honestly just go shooting at things even if they’re in my yard? I live in Brazoria County.